Well, that doesn’t apply in the business world. Even though you always help customers better understand your brand through content and storytelling, the first impression they get of your company will always be visual. Between logos, website layouts or your Facebook cover photo, it’s the images that lay the foundation for your online reputation. That’s why having the right Facebook cover photo size let’s you demonstrate your personality, brand story and even purpose as a company. With the wrong images, you’ll look unprofessional and unprepared. The good news? All you need for a great social experience is a little industry know-how, and a few simple tips. The right Facebook cover photo size is 820 pixels wide by 312 pixels tall on desktop. However, mobile users will see 640 pixels wide by 360 pixels tall. The correct Facebook cover photo is the first step to portraying the right image on social media. You must have a minimum size of 400 x 150 pixels. There’s no display available on feature phones. For the best results, upload an sRGB JPG file less than 100 KB. For images with a logo or text, it might be best as a PNG file. Facebook Business Page dimensions are exactly the same as personal accounts. Keep in mind that a huge portion of today’s Facebook audience is mobile, so ensure that none of your important content will be cropped out on a different device. Remember, your cover photo doesn’t necessarily need to be static anymore. You can now use a simple video instead of a static cover photo, which is a great way to share more information about how your business works. Your video should be the same size as a standard desktop cover photo. Ideally, you’ll want something that’s only up to a minute long. After all, if your customers focus on your cover photo for too long, they might not have time to check out the rest of your page. Fortunately, if you’ve found a video or photo that’s perfect for your social page, but the dimensions aren’t right you can always reposition it on Facebook itself. Alternatively, you can use our free tool Landscape to get the perfect Facebook cover photo size. The strict size rules for Facebook cover photos and profile pictures mean you’re limited on how much information you can convey on your page. While videos help you to go the extra mile in telling your company narrative, you’ll still need to be smart when choosing what to showcase. Covers need to be authentic: In other words, they can’t be deceptive, misleading or malicious in any way. Covers are public: You must choose something that’s going to appeal to a wide audience of potential followers and existing fans. Covers are yours alone: Brands can’t ask advocates to load their cover photo onto their timelines as an advertising technique. If you violate Facebook’s terms, then all your hard work in social media marketing will go down the drain. The last thing you want is to lose your Facebook presence over a bad cover photo. For everything else, check out the Facebook ad sizes guide and the social media image sizes guide for more help! Once you’ve learned the rules and you’re ready to start searching for the perfect image, make sure that you choose something simple and clear. While it might be tempting to pack your above-the-fold content full of keywords and information, your visitors look for a clean introduction to your company. Some of the best images use the Facebook cover photo size guidelines to draw attention to a single image with negative space. This makes additional features like “Follow” buttons and Calls to Action more appealing. This example from ThinkGeek combines a logo, with a simple image and tagline. The centered imagery draws attention to the buttons below and the picture highlights the nature of the brand, without drowning visitors in visuals. Images are more powerful than the average business thinks. In fact, we process images up to 60,000 times faster than text. With the right Facebook photo cover, you can engage your audience and earn their attention long before they read your social media posts. With that in mind, it’s important to ensure that your cover photo represents what your brand does. This not only helps your customer to know that they’re on the right page, but it also ensures that you present a more consistent image for your company online. The Bambu Facebook page draws attention to the digital nature of the app with a picture of a Laptop using the social advocacy tool. It’s clear, simple and relevant to the business in question. Showing off your happy, smiling team: Give your fans an insight into the humans behind your organization. Show your product in context: Demonstrate what your customers can get out of your offering with a picture that shows a client, or employee using it. Provide an insight into the office: If you have an attractive office, it’s a good way to show the professional side of your company. 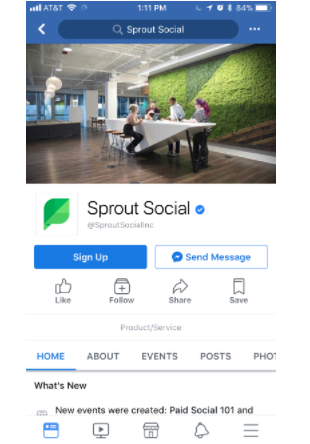 With the Sprout Social Facebook page, we showcase our personality with a glance at one of our hard-working groups working inside of our stunning office space. This helps to demonstrate our nature as a team-driven organization while indicating what life inside of Sprout Social is like. There are a few different schools of thought in the social media world–particularly when it comes to Facebook cover photo size. Some people think that it’s best to combine their profile picture and cover photo into a single cohesive image. Other experts prefer to spread their imagery out so that it pulls focus to the right spaces on the page. Of course, there’s nothing to say that you can’t do both things simultaneously–so long as it looks good. This Facebook cover from Oreo uses a beautiful graphic image on the right-hand side of their cover photo to draw the eye to the “Send Message” button. At the same time, the profile picture blends almost seamlessly with the cover photo because it uses the same design elements and the same colors. The overall experience is a highly cohesive page that pulls focus to the right elements on the page. Importantly, when you’re looking for ways to direct audience attention, make sure that you avoid using directional cues like arrows. Not only do these look tacky and aggressive, but your buttons and CTAs will also show up differently on mobile devices compared with desktops. This means you could end up with an arrow that points nowhere on mobile. By now you know the golden rules that should lead your Facebook cover photo size decisions. All you need to do is pick an image that resonates with the right target audience and pushes them to click on that “follow” or “send message” button. Text: Be cautious here, a small amount of text like a brief slogan can help to describe your brand, but too much could overwhelm your photo. Emotion: Happy customers or smiling staff can capture audience interest and make them feel more connected to your organization. Relevance: The image you choose should fit with both the nature of your company and your audience’s interests. Look at Coca-Cola’s cover photo for instance. The selection of glass cola bottles sitting on ice demonstrates the variety of beverages the brand offers while showing their commitment to tradition too. The ice makes customers think of refreshment and the whole effect is something that’s sure to accelerate your feelings of thirst. Choosing the right pictures, style, and size for your Facebook cover photo isn’t always easy. After all, this is your first chance to make the right impression on billions of potential customers. Fortunately, if you follow the guidelines above, and stick to the rules provided by this gigantic social media channel, you should have everything you need to engage and delight your customers.